The Oxford dictionary describes a halo as “A circle of light shown around or above the head of a saint or holy person to represent their holiness” or as “A circle of white or coloured light around the sun, moon, or other luminous body caused by refraction through ice crystals in the atmosphere”. The words Aura and Nimbus also refer to a halo. It is thought that halos may have originated in or even before Egyptian times. The goddess Sekhmet bears theSolar disk to indicate she is the daughter of the sun god Ra. The beautiful head of the lioness Goddess on display in the Burrell Collection has lost her Solar Disk, although you can see the socket where it would have fitted on the top of her head. 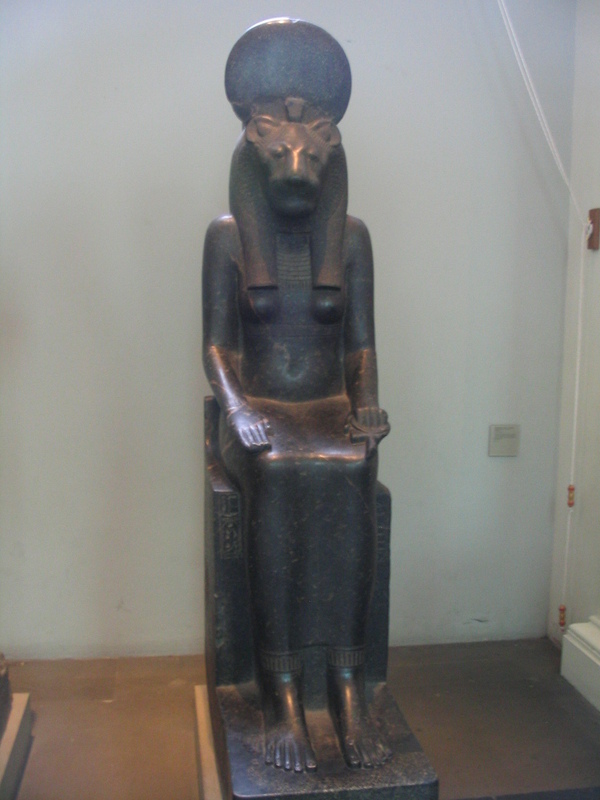 The Sekhmet below is from the British Museum. 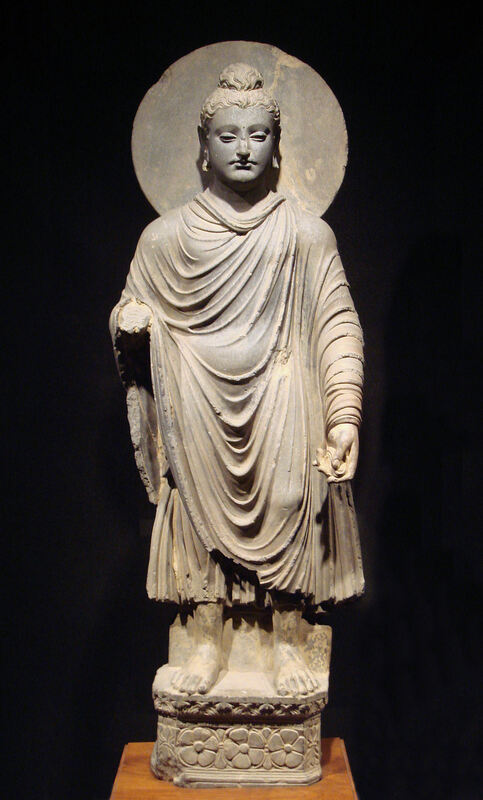 Many religions have adopted halos to indicated people of very special importance, such as in the standing Budda below, and in the Islamic painting later in the blog. 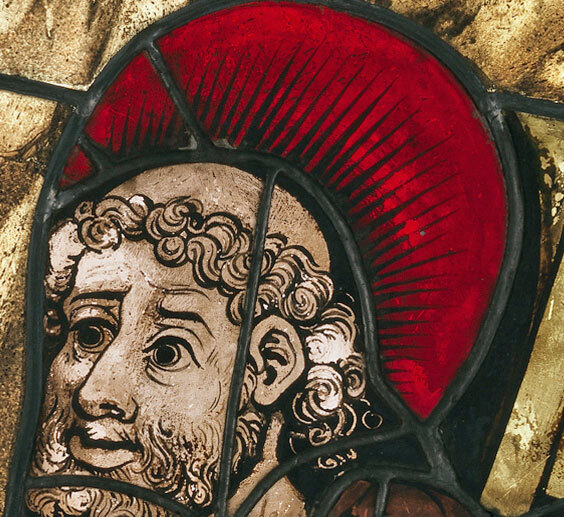 Halos have risen and fallen in popularity over time, but are well featured in the Boppard stained glass. 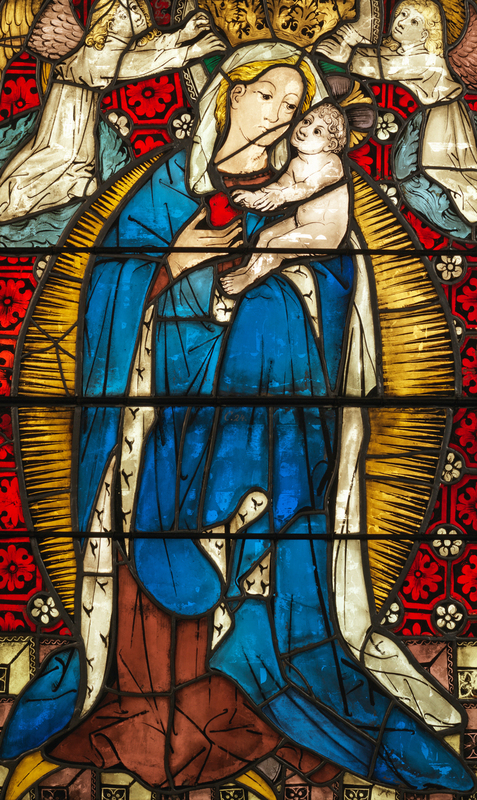 There are four different types of halo used in the Boppard glass from the Burrell Collection. The simplest halo of all was used for the angels, and consists of a simple yellow disk around the angel’s head, as shown in the example below. 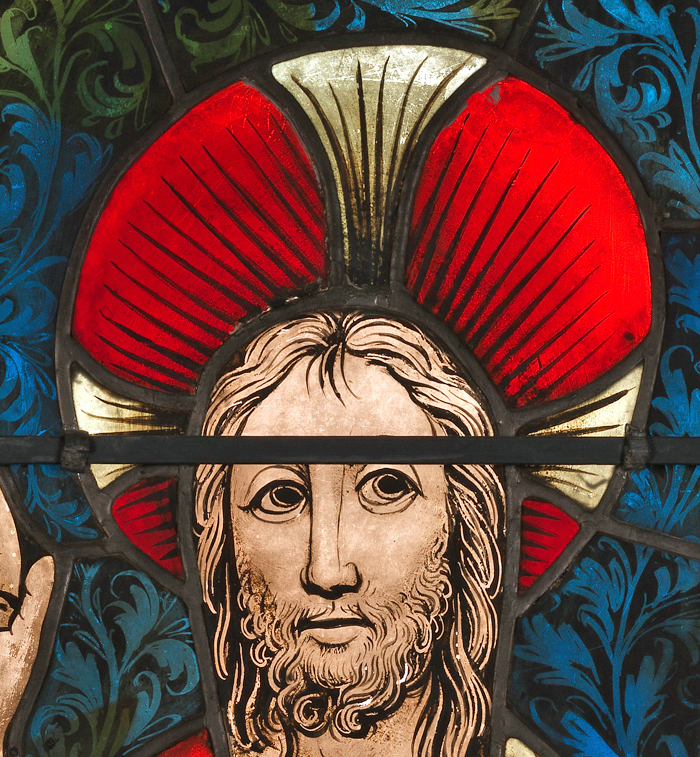 The saints in the Boppard panels have an enhanced halo with radiant lines emanating outwards. A range of colours are used to enhance the designs. The aureole, sometimes called a mandorla, is a full body halo, and is often used in depictions of the Virgin Mary to symbolise glory. 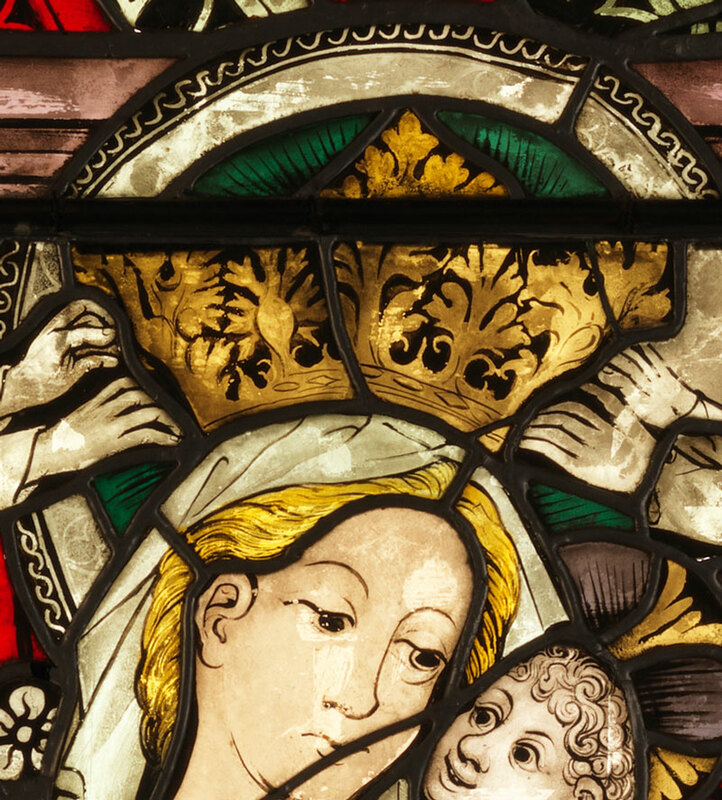 The mandorla is seen in the Virgin and Child panel detailed below. An alternative style of halo can be seen in the images of the Prophet Muhammad, such as the one on the left below showing the arrival of the Prophet in Jerusalem, from Mir-Heidar’s “Miraj Nameh”, a 15th century illustrated book from Turkey. Here, the halo is in the form of flames, common in Asian art, completely surrounding the Prophet, and around the heads of the other earlier Prophets. In the middle is a small brass statue of Budda in the Metropolitan Museum dating to the late 6th century and made in the ancient region of Gandhara, an ancient kingdom in the Swat and Kabul river valleys and the Pothohar Plateau, in modern-day northern Pakistan and eastern Afghanistan. In this statue, Budda has both a radiant halo and a mandorla. On the right is a statue of Shiva, (or Siva), one of the most important Hindu gods, completely surrounded by a flaming circular halo. The Boppard Virgin and Child panel, Mary also has a green halo around her crown, a colour associated with life, referring to her status as the mother of Christ. Jesus usually wears a cruciform halo, a radiant halo with a celtic shaped cross on it to emphasise his sacrifice on the cross and to symbolise the Holy Trinity. Other halos not used in the Boppard panels include the less common triangular halo and the square halo. 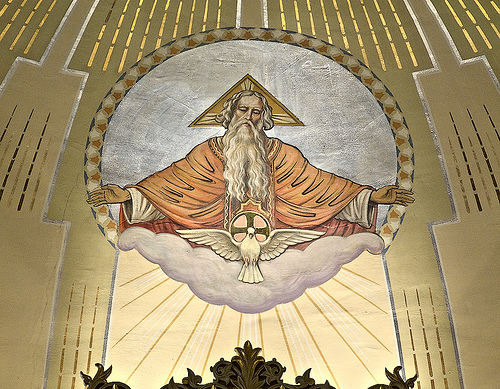 In this image behind the altar at Saint Peter Church, in Saint Charles, Missouri, God wears a triangular halo to symbolize the Trinity and the dove (symbol of the Holy Spirit) wears the cruciform halo. In this magnificent mosaic from in the Chapel of Bishop Zeno of Verona located within the church of St. Praessede, in Rome, the Virgin Mary is second from the right, between Saints Praxedes and Pudentiana, and the woman on the left is identified in the Greek inscription as “Theodora, Bishop” (“Episcopa”). Theodora is depicted with a square halo, indicating that the image was made when she was alive. Theodora was widely known to be a devout Christian in the early Church, and was notable for her acts of piety and sanctity. Since, in art, most people wear clothes, fashions and costume can be a fascinating area of study! Artists would use clothing to indicate a person of wealth, high status, part of the general population or someone evil. When the Boppard windows were being designed, anyone who was not Christian would have been a barbarian and therefore not good. 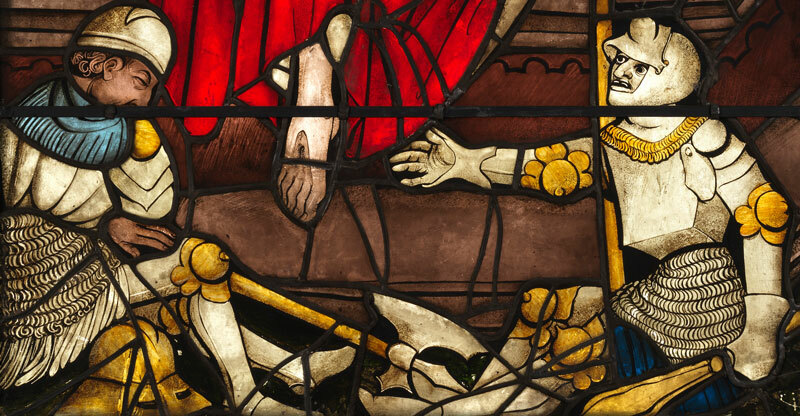 In the ‘Christ before Pilate’ panel shown below, Pilate would not have been seen as a good man. It is interesting to consider how he has been represented. Clearly, he is a wealthy man of high status. There is a possible Turkish influence to his costume, with a fur trimmed gown and pointed hat and pointed beard, as the Ottoman Empire was of great interest in Europe at the time. 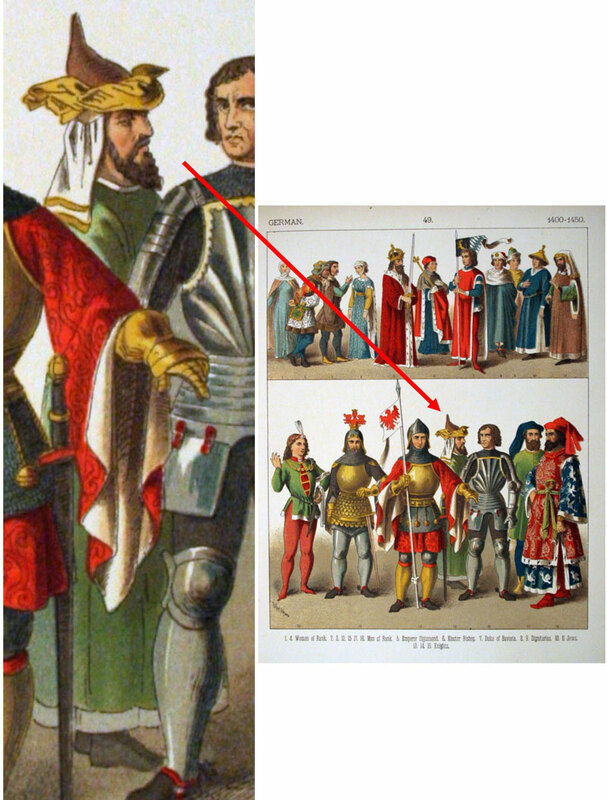 However, Albert Kretschmer in his “Costumes of All Nations” under 1400-1450 German costume shows a similar costume and describes him as a Jew. Albert Kretschmer (1825 – 1891) was a German professor and renowned painter and costumer to the Royal Court Theatre, Berlin. 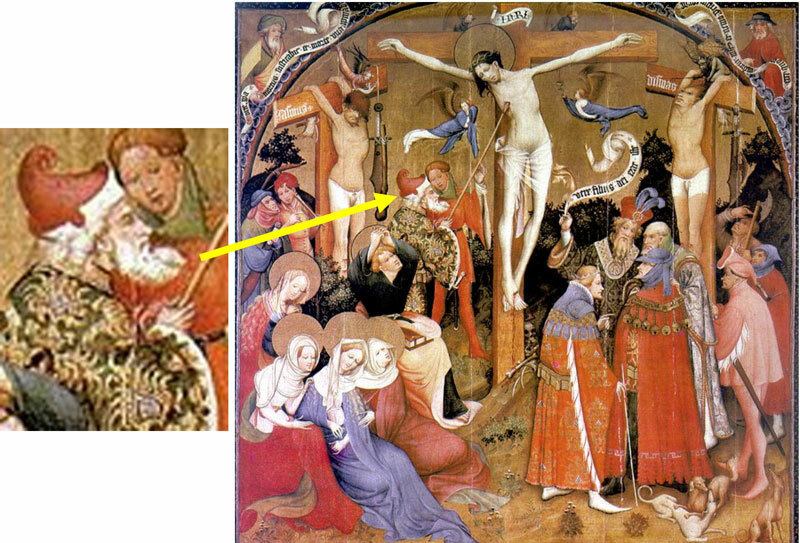 In the Crucifixion, painted in 1403 by Conrad von Soest who was based in Dortmund in Germany, we see a similarly dressed man with a pointy beard pushing the spear into the side of Jesus on the Cross. According to the Gospel of John (19:31–37), it was a Roman soldier (named in extra-Biblical tradition as Longinus), who stabbed him in the side to check that he was dead. 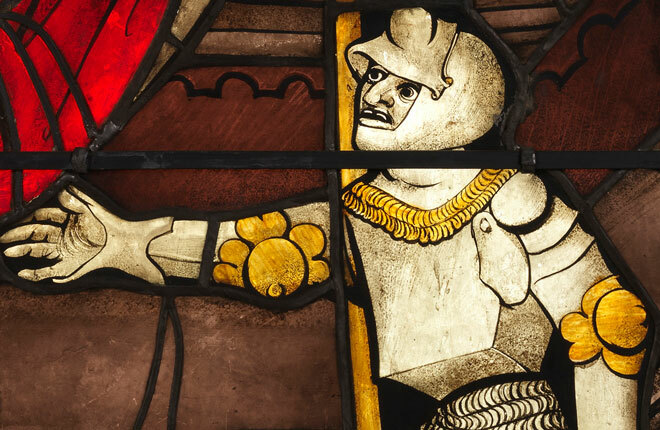 In this painting, it is not a soldier, but clearly not a Christian. Perhaps this reinforces the idea that the costume represented a Jew or someone from the Ottoman Empire? 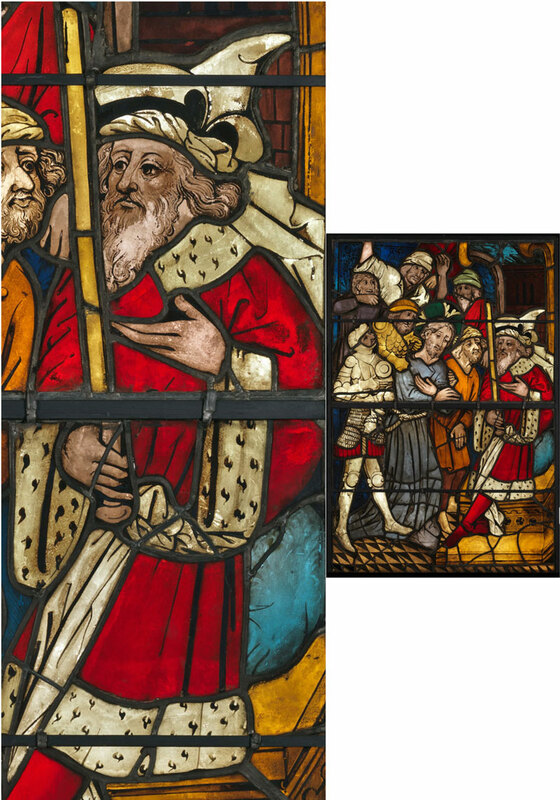 We can also compare Pilate’s costume with a man in the Stefan Lochner Altarpiece of the Patron Saints of Cologne, in Cologne Cathedral and painted in the 1440s when the Boppard windows were being painted. Would these be Jews or Muslims? 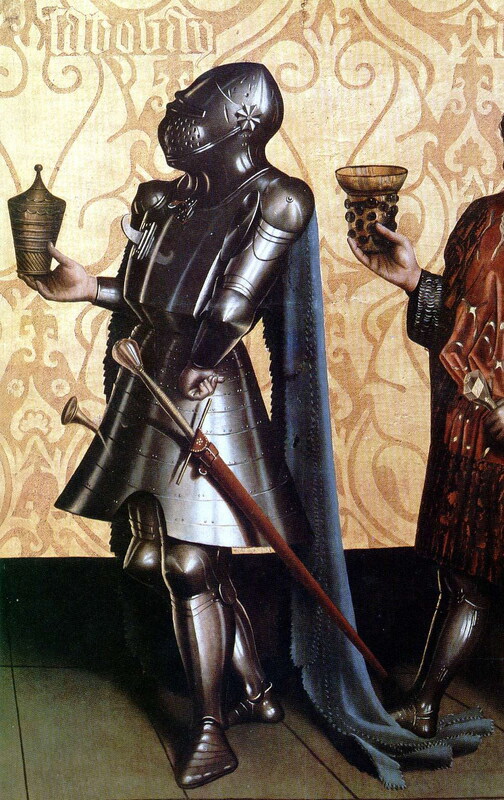 Was this style of costume worn by some of the wealthier people around Cologne in the first half of the 15th century? In the ancient courts of Asia and the Eastern Roman Empire, people of high status such as emperors or monarchs would have fabric canopies over their thrones as a sign of honour. This allowed the person of importance to be quickly identified in a crowd. This probably developed from very early times when people of importance, such as royalty, would have travelled under a cover to shelter from the elements. 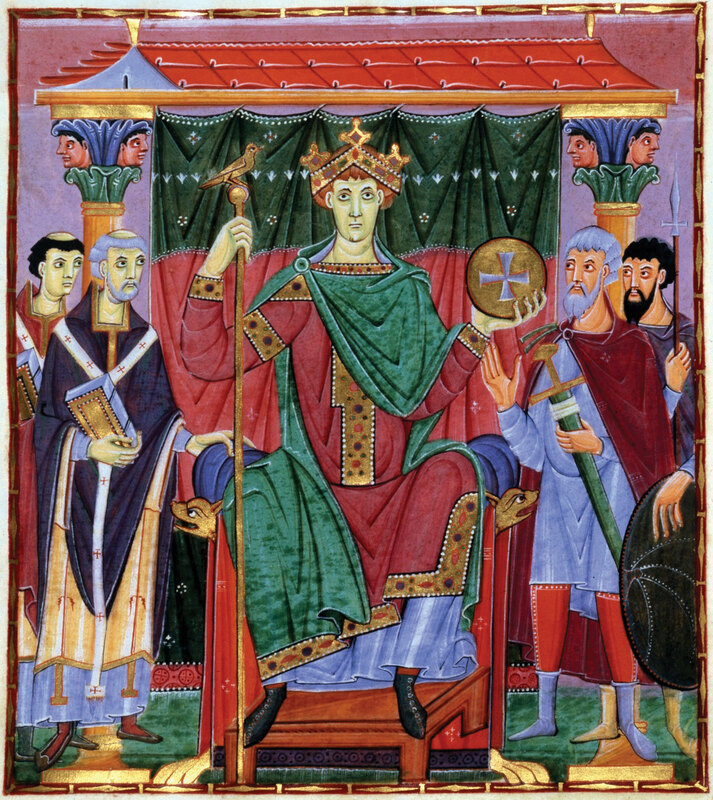 The painting below shows the Holy Roman Emperor, Otto III, who lived from 980 to 1002CE, enthroned under a canopy with a cloth of honour behind. 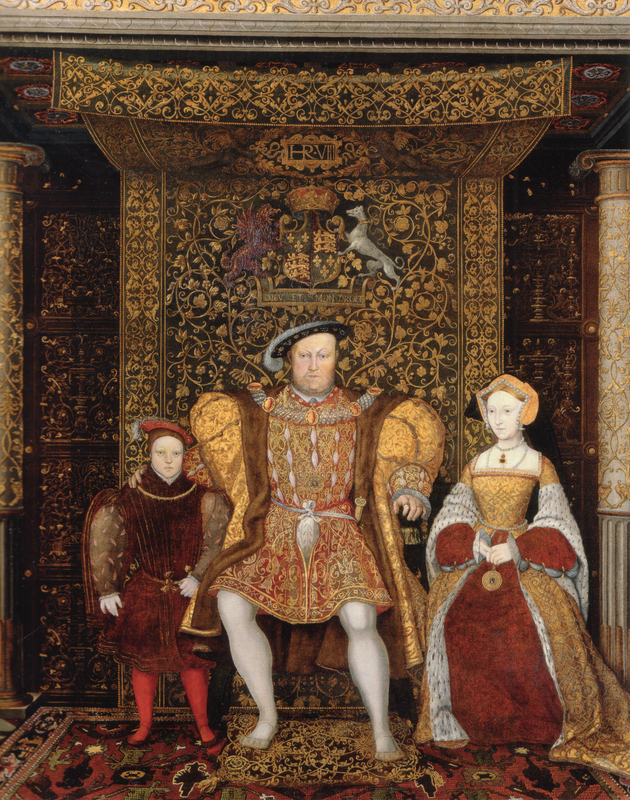 The detail from a painting of the family of Henry VIII, shows him on his throne with a cloth of state which forms both the canopy and the cover behind the throne. On display in the Burrell Collection there is a very fine example of a canopy made for Queen Elizabeth I, when she visited Sir Roger Wodehouse and his wife Mary Corbet at Kimberly Hall, Norfolk, on the night of 22 August 1578. Called the Kimberley Throne, it would have had a raised platform to place the Queen above ‘ordinary’ level of her subjects. Kings and Queens along with their court would often go on a ‘Royal Progress’ around their Kingdom to be seen by their subjects. On this occasion, Queen Elizabeth and her Court were on their way from Norwich to Cambridge. The heraldic arms of the Wodehouse and Corbet families is embroidered on the backcloth. The two ‘wildmen’ supporters of the shield of arms are a punning reference to the word ‘wode/wood’ in the name of the owner (‘wild man of the woods’), and these two men carrying clubs also recall, in the fashion of a parody, the classical hero Hercules, who is also usually depicted carrying a club in art. 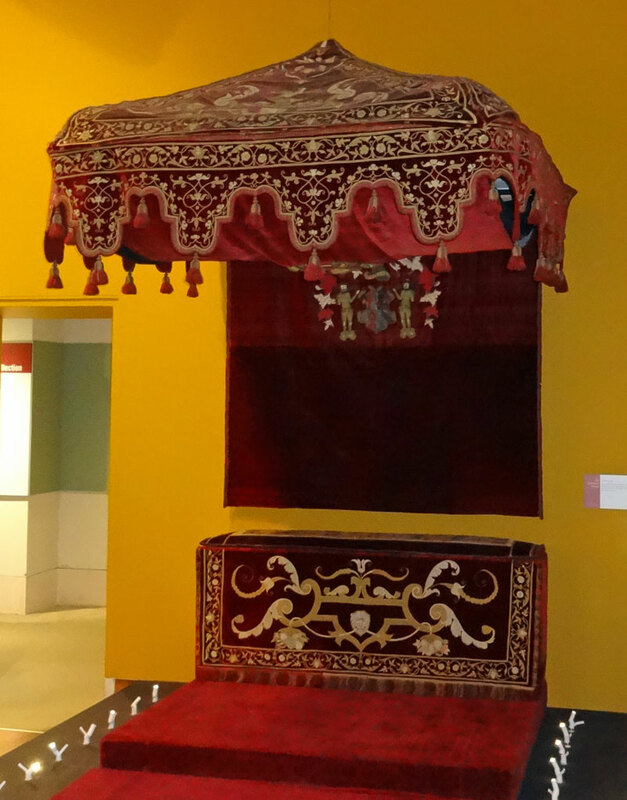 It is probable that this ‘throne’ was made up from hangings which already existed in the Hall, and perhaps originally formed part of an elaborate tester bed. The rich embroidery was professionally worked, and possibly carried out in Italy. It was a great honour to host the court but the cost could bankrupt a family as there were dozens of people in the court to be entertained and looked after. Hosts would compete to put on better and more lavish hospitality than anyone else. Although the terms are often used interchangeably, a cloth or portable canopy is properly described as a baldachin. The term baldachin (there are lots of different spellings) derives from the Italian “Baldacco”, referring to a rich embroidered brocade of silk and perhaps even gold, that was mainly sourced from Baghdad. If the canopy is a more permanent structure of wood or stone, such as might be found over a church altar, it is referred to as a ciborium. Ciborium can also refer to the architectural niche in which the statue of a saint is placed, as in the 15th century French or Flemish example from the Burrell Collection above; a limestone niche with a Saint holding a shield. I’m going to just call them canopies! As an important symbol of status, canopies are everywhere in Christian art. 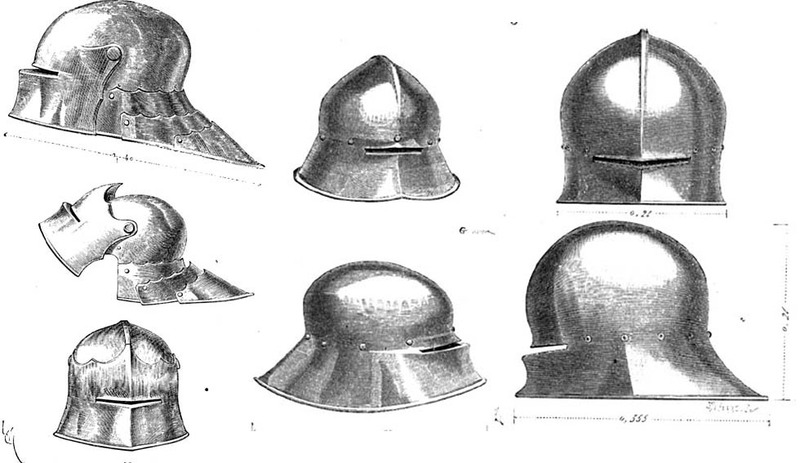 Reliquaries and other church objects designed to contain objects of great religious significance often also have canopies. For example, the early 16th century German Monstrance (below), made with gilt and engraved copper with champlevé enamelling shown below. Monstrances were used to display the consecrated Host for the Mass and to carry it in procession. In the Burrell example, the rock-crystal cylinder which would have contained the Host is missing. 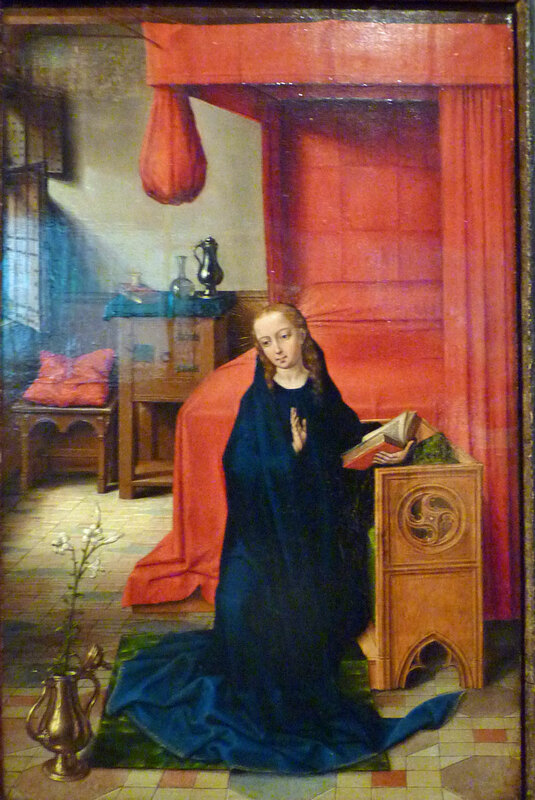 Just to compare two examples of the Annunciation; the left wing of a triptych (below) by an artist with the catchy name “Master of the Prado, Adoration of the Magi”, and the Nottingham alabaster (at the bottom) that has been mentioned before. 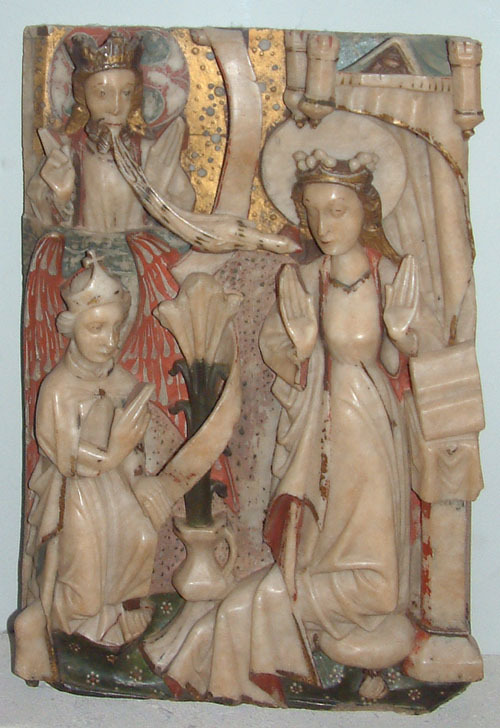 The Nottingham alabaster shows Mary reading her bible (the Old Testament) while kneeling under a canopy. The wing of the triptych is a little different; as Mary is in her bedroom, the artist has used the four-poster bed with the curtains folded into a tear shape exposing the unused bed (alluding to her purity) and creating the effect of a canopy to emphasise her status. We’ll take a look at canopies in stained glass in the next blog. The Church at Boppard from which the fabulous Boppard stained Glass windows came from, was built by the Carmelite Order in the first half of the 14th century and extended to the north between 1439 and 1444. It is therefore appropriate to take a short look at the history of the Carmelites, up to the building of the church at Boppard. 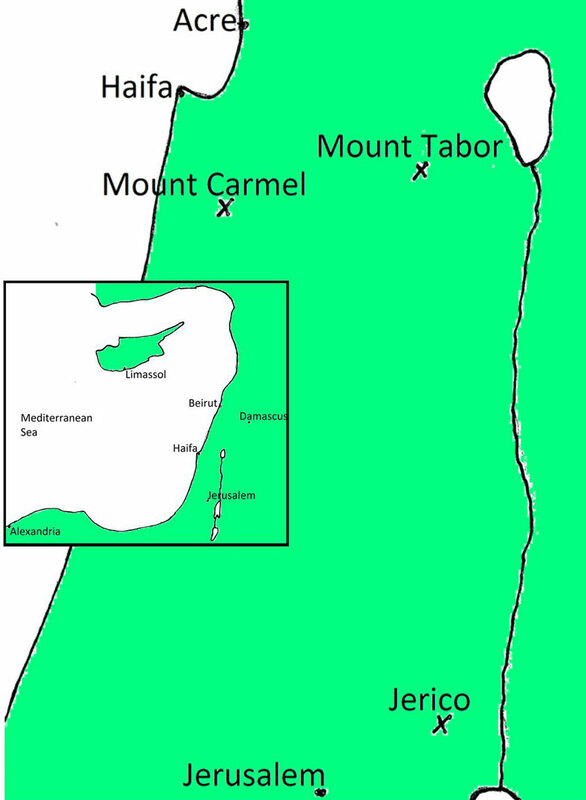 At the time of the crusades, Christian pilgrims flocked to the holy land, and after fulfilling their pilgrimage, some wanted to follow a life of prayerful solitude and service, and settled in different parts of the holy land, including the mountains around Jericho, the range of Mount Carmel by the Mediterranean sea, and Mount Tabor near Galilee, which is traditionally identified as the Mount of Transfiguration (so called because – according to the gospel of Matthew, chapter 17 – on this mount or hill Jesus was transfigured before his disciples: “… and his face did shine as the sun, and his raiment was white as the light…”). Saladin was the first Sultan of Egypt and Syria and founder of the Ayyubid dynasty. In 1187, he had a great victory at the Battle of Hattin over the Crusader forces, where his Muslim armies inflicted a major defeat, effectively eliminating them as a fighting force and opening the way for the re-conquering of Jerusalem and several other Crusader-held cities. The only area now left to the Christian pilgrims to settle in was Acre and some areas along the med coast. The group who chose Mount Carmel were following the example of Elijah (also Elias), a holy man and a lover of solitude, who is described in the Book of Kings. 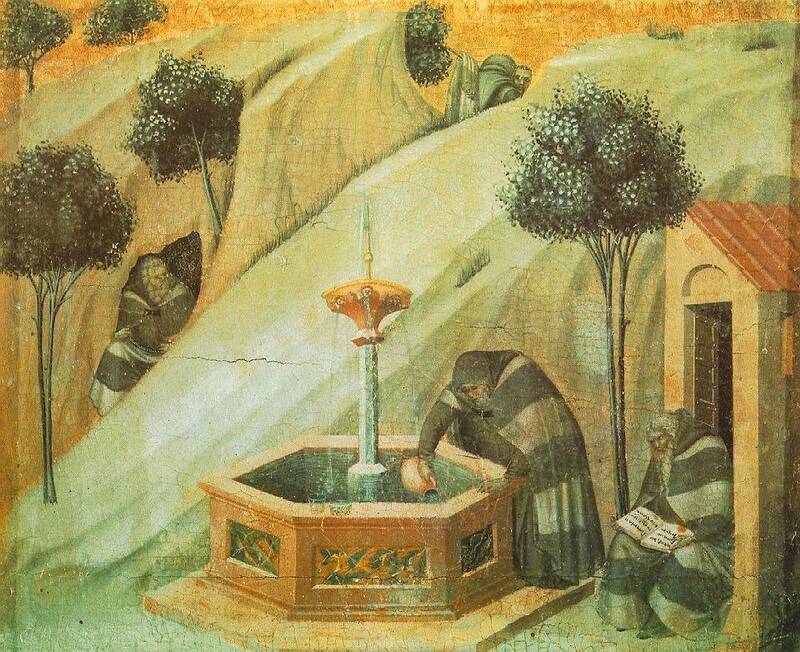 They established themselves in small cells and followed the Eremitic (or hermit) lifestyle near to a spring known as Elijah’s Fountain. As independent hermits, this group had no founder, but after some years they decided to come together and become more formally organised. One of them, Brocard, sometime around 1209 and acting in a leadership role, contacted a priest of the Canons Regular and Latin Patriarch of Jerusalem, Albert of Vercilli (later to become St. Albert Avogadro) to write a ‘rule of life’ – a set of rules of consecrated life in the eremitic style. The result is the shortest rule of life in existence of the Roman Catholic spiritual tradition. The full pdf of these rules is available at http://www.carmelite.org/documents/Spirituality/rsacodtranslation.pdf. The Carmelites took Mary, the Mother of Jesus, as their patroness, and they gradually became known as the Brothers of Our Lady of Mt. Carmel, and looked to the figures of Elijah and Mary for inspiration, and dedicated their first chapel to the Mother of God. The Carmelites position on Mt Carmel was often under threat. They had been driven from Carmel but had managed to return and build a slightly larger church than the original, but eventually around 1238, the position of Christians in the area was so precarious that they had to leave. They spread out to other countries (often their countries of origin, as many of the monks would have been crusaders or pilgrims), such as Cyprus, Sicily and France (Marseilles). Eventually, in 1242, they reached England (Hulne, near Alnwich in Northumberland, Bradmer in Norfolk, Aylesford, and Newenden in Kent), accompanying the Barons de Vescy and Grey returning from the crusade of Richard, Earl of Cornwall (1241). No longer perusing an eremitic lifestyle, the Carmelites turned from being hermits to friars, assumed the mendicant tradition, forbidden to own property in common, working and go wherever they were needed. In 1291, the remaining hermits on Mount Carmel were put to the sword and their convent burnt down. The original Carmelite order was approved by Honorius III in 1226, and by Gregory IX in 1229. Partly due to their new distribution out of the desert and into cities, fresh approval was sought and given by Pope Innocent IV in 1245. 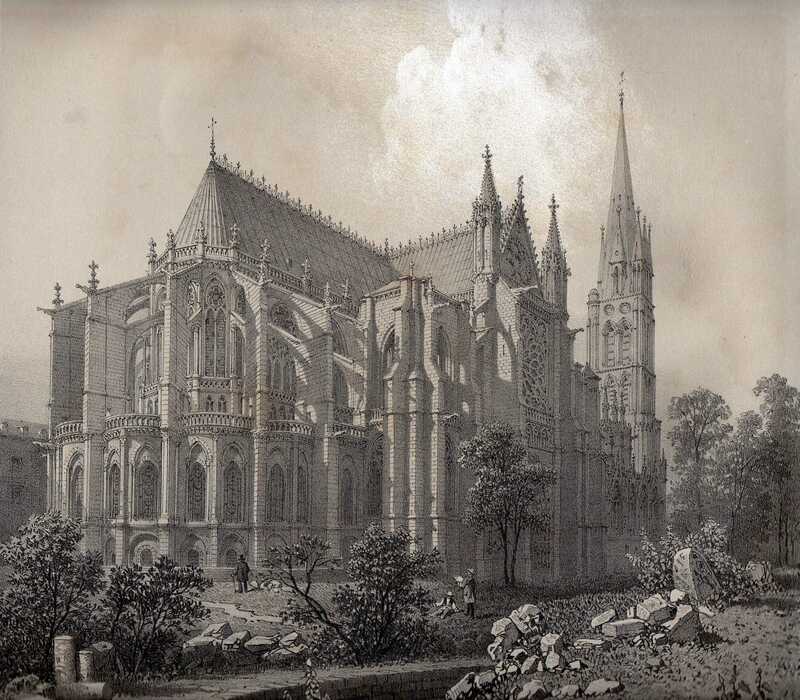 At the second council of Lyons in 1274, the Carmelite order was definitively approved. In 1287 the Carmelites adopted a pure white woollen mantel, which caused them to be called Whitefriars. The mantle is an important monastic vestment, which covers the whole person with the exception of the head, and has much symbolic meaning. It is sometimes referred to as the Angelic vestment due to its flowing lines which allude to the wings of an angel, and its folds represent the all-embracing power of God as well as the strictness, piety and meekness of the monastic life. The absence of sleeves indicated that the hands and arms of a monk are not for worldly activities. The scapular has been an important part of the Carmelite habit since the late 13th century. It is like a long piece of cloth, about chest width, with a head sized hole in the middle so that it hangs equals down the front and back of the body. The Carmelite Constitution of 1369 stipulates automatic excommunication for Carmelites who say Mass without a scapular, while the Constitutions of 1324 and 1294 consider it a serious fault to sleep without the scapular. 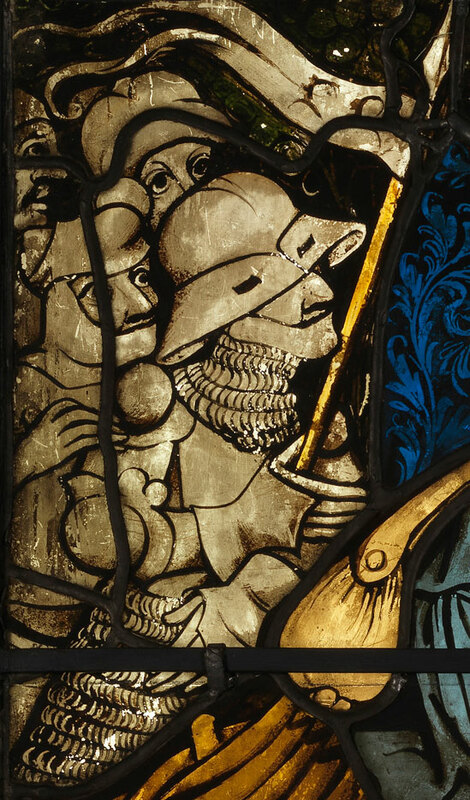 In the Siegfried von Gelnhausen panel, although not a friar himself, he is seen wearing a blue scapular. Tracery is the “Ornamental work of interlaced and branching lines, especially the lacy openwork in a Gothic window” (From The American Heritage® Dictionary of the English Language). It is likely that tracery evolved from Byzantine windows and pierced marble, and medieval tracery arose from the need to terminate 2 or more mullions, the vertical stone shafts dividing window lights, within the frame of a pointed arch as shown in the grey area in the diagram below. Early Romanesque church windows were normally small, with a round or segmental (less than a semi-circle) arch at the top. 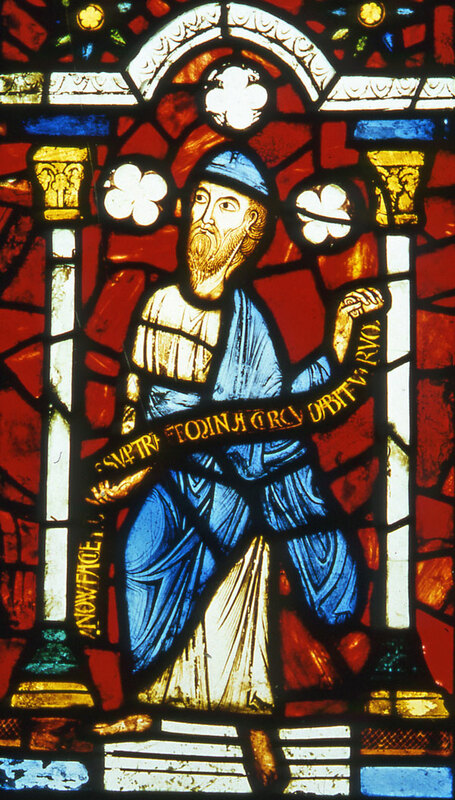 At the start of Gothic architecture, increased understanding of the forces involved in a building and the introduction of buttresses and flying buttresses, windows became larger and wider, with pointed arch designs a can be seen at the Abbey of St. Denis near Paris, glazed in the 1140s by Abbot Suger and from which a small panel is on display in the Burrell Collection showing the Prophet Jeremiah. These windows were usually divided into 2 or more bays by vertical stone pillars (mullions) which gave the extra support needed by the glass. The earliest tracery decorated the above these bays with small circular, trefoil or quatrefoil lights, which has become known as plate tracery as the design looks as though it has been cut out of a plate of solid stone. The actual construction would have consisted of several pieces of stone. With the trefoil and quatrefoil designs came the introduction of cusps (projecting points) into the arch design. 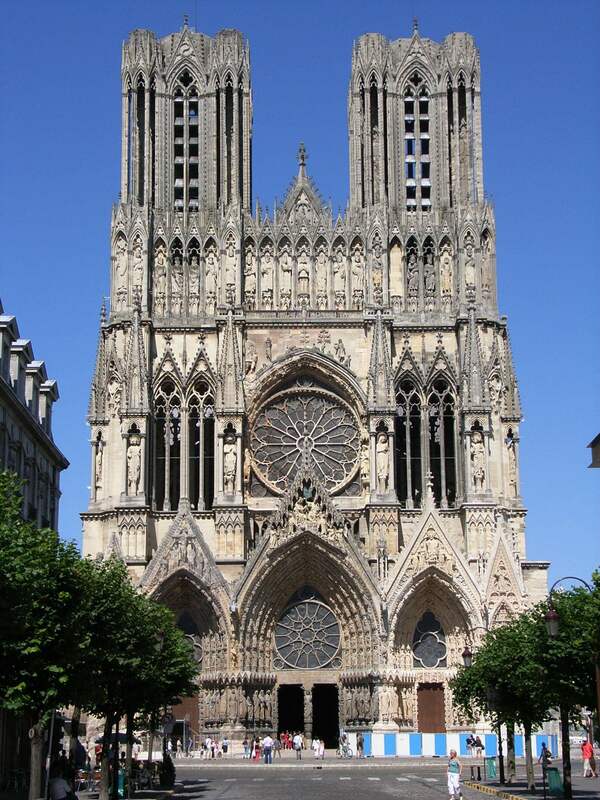 In the early 13th century, the tracery became slimmer and more varied in shape leading to Bar Tracery, first seen at Reims Cathedral, built in the early 13th century. Slim stone bars or ribs were used to create a skeleton of geometric shapes, which lead on to flowing, curvilinear and flamboyant designs. Bar tracery allowed a degree of mass production as many blocks could be made using standard templates and could be carved in the workshop when the weather would have been too poor to work on site. 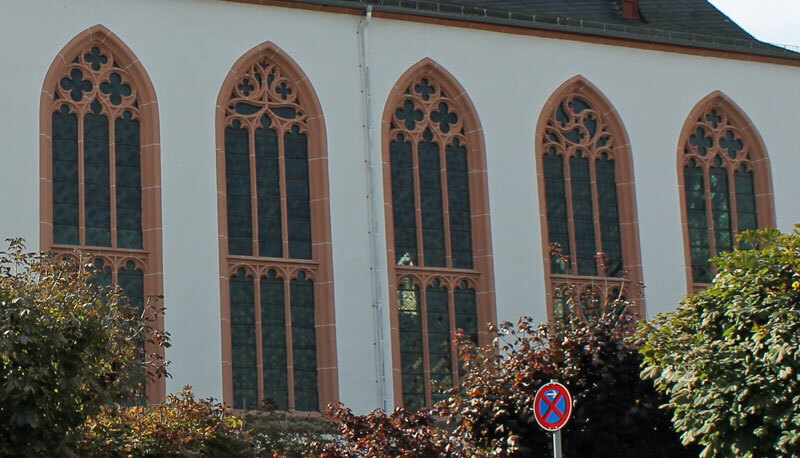 The tracery in the Boppard windows is simple but effective, using cusped arches, quatrefoils and subdivided circles with mouchettes (teardrop-shaped designs). The Islamic designs in Spain at places such as the Great Mosque of Cordoba with its complex tiers of compound arches, had a great influence on Gothic architecture and tracery design. 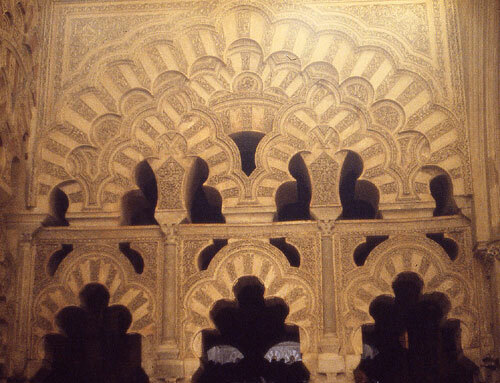 As the Reconquista spread south through Spain, many aspects of the Islamic design of arches were incorporated into Christian designs. The small lights that were fitted into the holes in the tracery were often designed to complement the imagery, themes and stories displayed in the main panels, with depictions of angels or associated symbols and emblems. 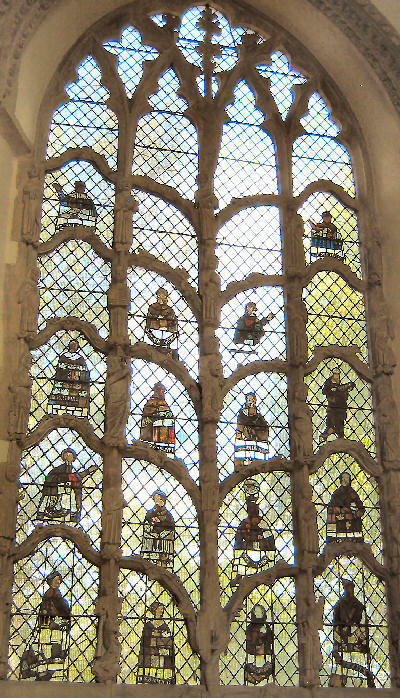 Even the tracery could be designed to reflect the content of the glass as in the 14th Century “Tree of Jesse” Window in Dorchester Abbey. Tracery declined in the 16th century with the Renaissance, but returned in the 19th century with the Gothic Revival. The name, tracery, probably comes from the ‘tracing floors’ (called épures in French) on which the full size design for the window was drawn, and the blocks of carved stone could be laid down and checked for fit before installation. 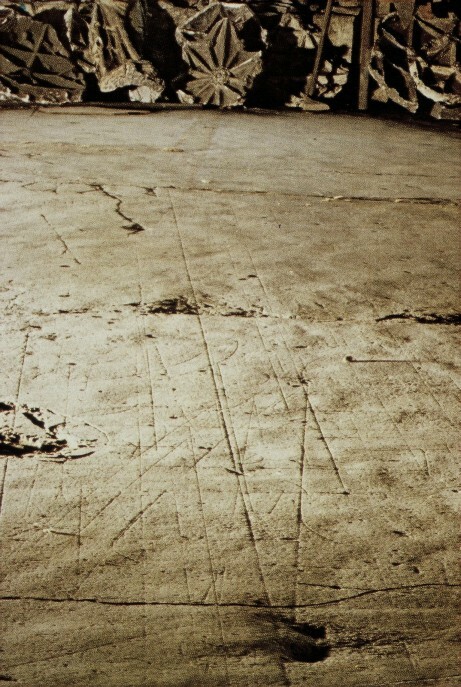 The floors also allowed for easy communication of ideas between craftsmen and a clear understanding of the finished design. Tracing floors still exist in Wells Cathedral and the Mason’s loft at York Minster. There’s more to angels than you might think! The word “angel” derives from the ancient Greek word ángelos which means messenger or envoy. Angels are often depicted in human form with feathered wings and they feature in many of the world religions and can be seen as guiding spirits and intermediaries between Heaven and Earth. In Christian theology, there is a hierarchy of angels from those that intercede and communicate with humans to those next to God. There are subtle differences in exactly how many different angels exist and their relative status, and this has changed over time and between denominations. The most common structure has nine types of angels (the nine choirs) divided into three main levels of importance. 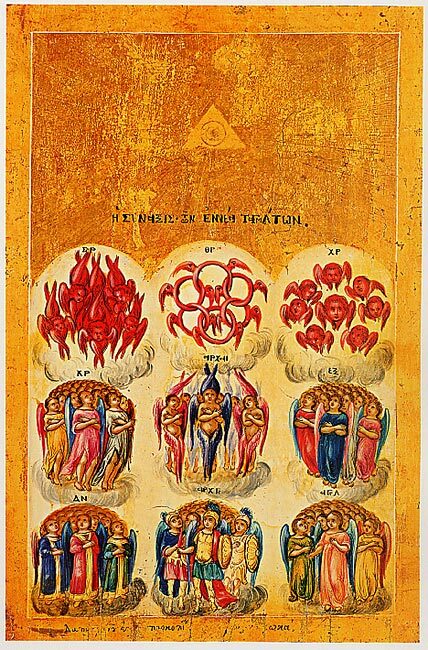 The painting from Greece below, possibly painted in the 18th century, shows the nine orders of angels with an illuminated triangle, a symbol of the Trinity, above. The angels are ranked according to their perfection, innocence and piety. Whilst all angels are far more perfect and innocent than any human, those in the top layer nearest to God, the seraphim, cherubim, and thrones, burn with religious passion. The angels in the bottom tier nearest to humans are the principalities, archangels, and angels, and as the least perfect and innocent, they interact with humans as messengers and protectors. In the middle tier are the dominions, virtues, and powers: The dominions are like God’s civil servants, making sure that God’s commands are carried out, through the virtues, God keeps an eye on the seasons and visible heavens, and the powers fight and defeat evil spirits. 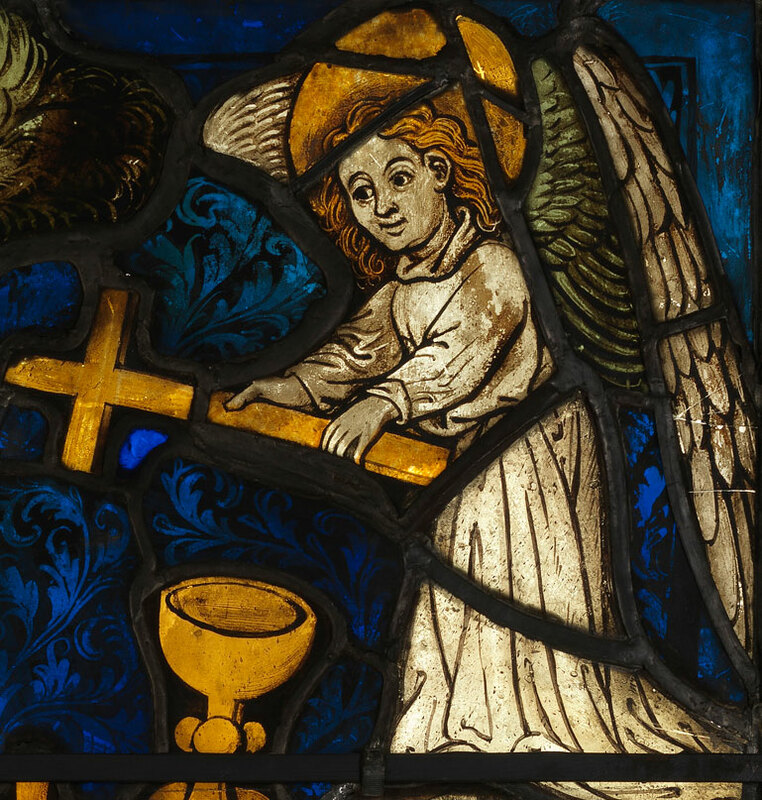 For people to relate to angels they are usually depicted in a human or human-like form, especially the angels on the lower tier such as the Archangel Gabriel who is seen in the Annunciation scenes bringing the news to Mary of her forthcoming pregnancy. 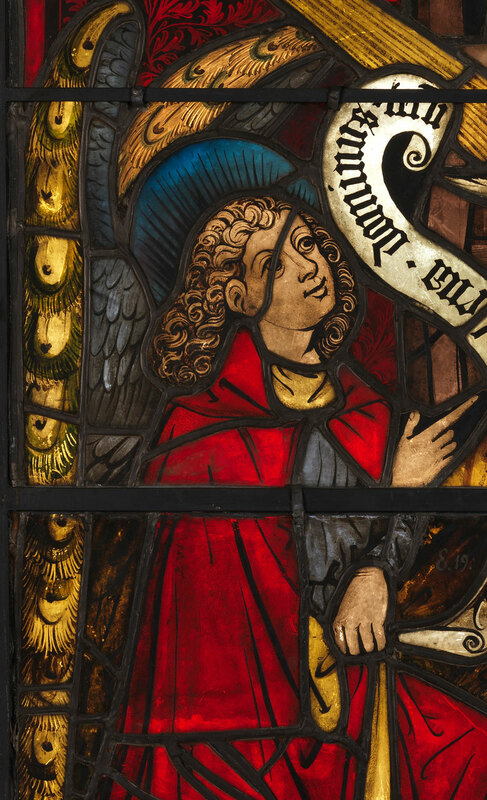 The Boppard Annuciation panel from the Jesse Tree window shows a classic Angel Gabriel as seen in the detail below. The Agony in the Garden panel shows another, unnamed, messenger angel. In both these depictions, the angels look like normal adult humans except for their splendid wings. 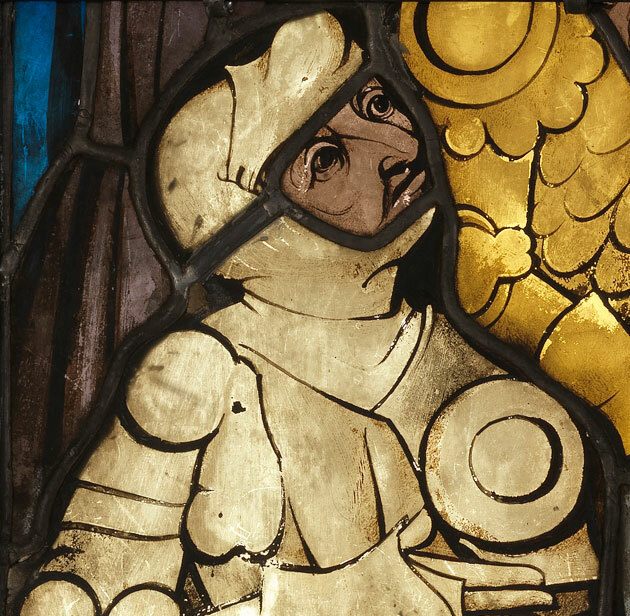 The Burrell Collection has some beautiful depictions of angels in little panels made by the EnglishNorwichSchool of stained glass who created most of their work between the mid-14th to the early 16th century. They had a characteristic style to their depictions of angels which is believed to stem from the way angels were portrayed in the Mystery Plays of the time, where actors would wear feather costumes. Mystery plays are among the earliest formally developed plays in medieval Europe. Medieval mystery plays were mainly based on stories from the Bible. They were at their most popular in the 15th century, and included a musical style called antiphonal song, which involved two or more choirs or singers taking alternating parts. 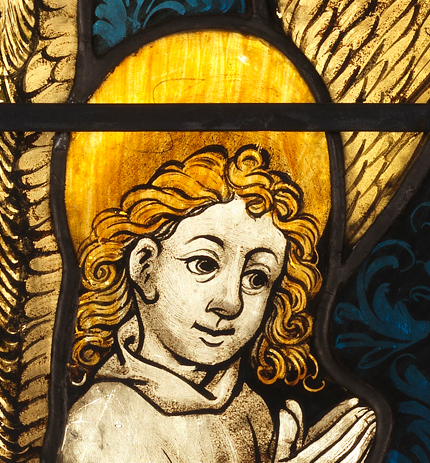 The two little Norwich school angels, shown below, are on display in the Burrell Collection.